As many of you who know me have learned, I am currently waiting (rather impatiently) for June to arrive. You see, on June 3rd, I will be flying (courtesy of Veterans Airlift Command) to Ponta Vedra Beach, Florida for three weeks of training with K9s for Warriors. K9s trains and provides service dogs for Post 9-11 Veterans suffering from PTSD, and they do it free of charge to the veteran. There are many ways a Service Dog benefits veterans with PTSD. The International Association of Assistant Dog Partners (IAADP) has put together a rather extensive (but by no means exhaustive) list of various tasks these dogs can be trained to perform for their partner. These tasks can include ‘blocking’ to create a personal space barrier for veterans who have issues with people standing to closely to serving as a ‘reality check’ to combat hyper-vigelance. They can provide tactile stimulation to break the veteran from a dissociative spell brought on by a flashback. The things these dogs can do are amazing. Two stories come to mind, both relating to graduates of K9s for Warriors. The first involves R and his partner M. As they were taking their daily walk, they came across an in-ground hornets nest. M saved her humans life and nearly lost her own when, after her human was brought to the ground by the hornets trying to attack his face, she laid herself forcefully across his face to protect him. She received hundreds of stings, swallowing dozens of hornets. Her vest probably saved her life as the hornets stings could not penetrate it. She instinctively knew her job was to protect her veteran. Today both are healthy, still working together and doing what they can to help other veterans. The second story concerns L and his dog S. L had been feeling very poorly and had gone to lay down to rest but his service dog S would not leave him alone. She kept licking him and pawing at him, trying to keep him from falling asleep. Finally L decided to heed S’s alerting behavior and called for help. L had been suffering a heart attack and S’s alerting saved his life. L is still recovering and S is never far from his side. There are many more stories out there about how many of these dogs have saved human lives; dogs trained to alert for seizures, food allergies, diabetes, depressive episodes, panic attacks…the list goes on and on. I know I am quite lucky to have been chosen to receive a service dog. Many wait for years to be selected. My hope is that this service dog will allow me to resume some of the things in my life that I have not been able to enjoy because of my PTSD. Something as simple as taking my girls to the zoo without having to leave as soon as it begins to get crowded, or going to the park and staying until they are ready to leave rather than leaving as I begin to feel hyper-vigelant due to the presence of other people as I try to keep track of three very active young girls. I want to be able to walk through the grocery store with my husband without needing to leave him halfway through and go to the car where I feel ‘safe’…hell, being able to go to the store by myself without having a panic attack. Another reason I am eagerly awaiting this gift is to assist me during therapy, when things get emotionally overbearing, he will be there to keep me grounded. Also, because I know my medications will not keep my symptoms at bay forever. I’ve already seen them faltering, beginning to become useless to my body and mind. Having this dog will ensure that when the meds stop working, I will still have that back-up to help mitigate the symptoms of my disability. I know he won’t be a cure, but he sure as hell will be an amazing tool in my healing process. 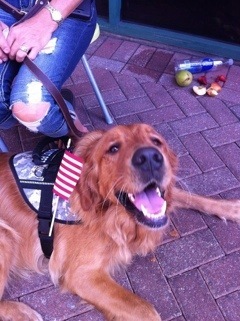 Take a few moments today to look at all the things these dogs can do for our veterans with PTSD. If you have the ability, donate what you can to help ensure that other veterans will have this priceless resource available to them. Training a service dog can easily cost more then $10,000 with no guarantee that the dog will graduate to full fledged service dog status. Some service dog academies suggest fewer than 30% of service dogs in training will graduate, the requirements are extremely high and most dogs can’t meet those standards. Some of the dogs who don’t make it can be retrained into other areas of service (therapy dog, in home service dog, etc). That is an expensive gamble that these organizations take on behalf of our veterans. If you can’t afford to donate money, perhaps you could donate your time at a local animal shelter. Many organizations that train service dogs for veterans rescue the dogs from local shelters. Or perhaps you could simply send them a short note thanking them for what they do for us. They are literally giving veterans a new life with 4 paws.